The Gilets Jaunes (GJs) or Yellow Vest movement began officially on the 17th November 2018 but according to some analysts this people’s initiative was being ignited long before and is a product of successive French government marginalisation of important sectors of the French population. Thomas Flichy de Neuville, academic and historian, wrote very recently about the socio-political alarm bells that preceded the Gilets Jaunes by at least five years. Lassalle’s report was submitted to the presidents of the assemblees in April 2014. Lassalle warned that nine out of ten people in France were ready to “explode”, three out of ten were ready to mobilise if and when the “explosion” took place. Lassalle prophesied that “Les réseaux sociaux sont prêts à agir comme une arme formidable de mobilisation” “social media is ready to to act as a formidable weapon of mobilisation”. According to Flichy, the one problem with Lassalle’s ground breaking report was that he predicted the imminent eruption of dissent “it is ten minutes before midnight”, Lassalle wrote. Nothing transpired as predicted in 2015 and the 196 page report was consigned to the archives, its prescient contents forgotten as France buried itself in a foreign intervention quagmire in Syria, Yemen and Mali and ignored the gathering storm at home. 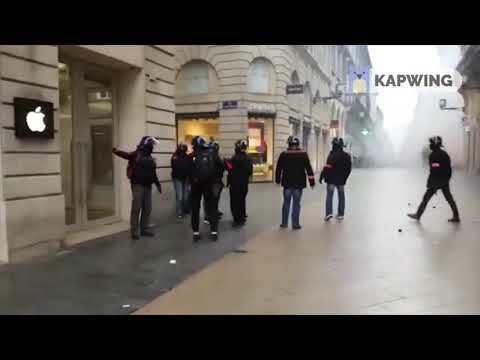 I don’t know of one policeman or one gendarme who has attacked the Gilets Jaunes, on the other hand, I know many police or gendarmes who have taken defensive measures to defend the Republic, the order of the Republic – you know there is no “liberty” without public order [..] but naturally I have never seen a gendarme or a police officer attack a demonstrator or a journalist, on the contrary I have seen demonstrators systematically attack our security forces and journalists. Chart produced by independent journalist, David Dufresnes and Mediapart showing injuries received by GJs and civilians from Police weapons and brutality during protests. Two students were recently inteviewed by independent French media channel, Mediapart. Antoine Boudinet lost his right hand when a GLIF4 grenade exploded close to him in Bordeaux, December 2018. Lola Villabriga was hit in the face by a LBD40 flashball bullet which triple-fractured her jaw in Biarritz, also December 2018. Chart taken from the website of ACAT, an NGO arguing against increase in repressive laws in France, showing the weapons deployed by France during crowd control compared to other EU countries, November 2017. Conclusion – Chaos Strategy Unleashed? Alexandre Langlois, police violence and the Gilets Jaunes.